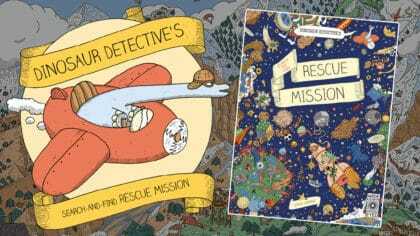 Search the packed scene for dinosaur friends in Dinosaur Detective from Wide Eyed Editions! See a sneak peek blow! Jump aboard the red aeroplane with Dinosaur Detective and travel the world in search of lost animals! From the jungle to the stormy sea to outer space, test your spotting skills in this puzzle-packed tour of a dozen different destinations. Can you spot everything in these packed kaleidoscopic wonder mazes?